Sign Up for Our Email Newsletter Subscribe! …producing exquisite award winning wines enjoyed by our guests visiting the winery, at local restaurants and specialty wine shops, however, 40% of our production is distributed to the public via an active winemaking COOPerative fostering friendship, enology education, and best of all, fun. At family gatherings long ago I remain with fond memories of joining my grandfather Dominic to his basement wine room. I recall the cool musty experience, the old dark wine-stained barrels and the interesting and consistent smell of his wine room. In preparation for a family dinner he would carefully pour his ruby-red homemade wine from one of his barrels into a large ceramic pitcher. Inevitably he would then put a finger over his lips suggesting we share a secret. “Frankie, do you want a taste of grandpa’s wine?” And with a predictable nod of approval he reached for a small glass, carefully opened the tap on a barrel and poured us a small sample. We shared a sip and always exchanged mutual smiles of approval. I can now reflect that those memorable and endearing times with my grandfather and my observation of the joy he experienced sharing his very own homemade wine with his family. It pleases me that I am now the one making memories for my family, my friends, and that may now include you. Over the last 20+ years, I have refined my wine making skills through the study of advanced enology literature, attending educational opportunities at national symposiums and from valuable hands-on lessons learned from yearly wine making. As the saying goes, “Life is too short to drink cheap wine.” Making a truly great wine takes time, patience and significant expense on many levels, but it always begins with the procurement of quality fruit! At this time, First Crush Winery produces 4200 cases, 50,000 bottles, of award winning wines annually. We are fortunate to be able to obtain remarkable fruit from the finest growing regions in northern California and from growers that we know and trust. Four days following harvest, the fruit is in our hands and the many month winemaking process begins. Not many would expect high-end complex fruit-forward wines to be produced right here on Cape Cod, however bottle by bottle we are changing that perception! We are thrilled to have been featured in a new movie based on the New York Times Best Seller “Year By The Sea”. Fusion: Fusion depicts the perfect marriage that has taken place with a carefully selected family of Bordeaux varietals. Fusion is a powerful fruit-forward blend with a long complex finish. It is comprised primarily of Cabernet Sauvignon harvested from deep-rooted rocky volcanic hillside vineyards and also from bountiful topsoil-rich valley vineyards. This blend also contains lesser amounts of Merlot and Malbec. Fusion is aged in new French oak, medium-toast, for one year. visZINary: The word visZINary was derived to highlight the wine and the vision of the winemaker. This wine does not have the sharp characteristics of a typical Zinfandel. It is a softer fruit-forward surprise. visZINary is comprised primarily of old vine Primitivo Zinfandel blended to a lesser extent with Petite Sarah. To capture a hint of a caramel influence, this tasty zin is aged in new Hungarian oak, medium toast, for one year. Rapture:100% Sangiovese: Italian, typically Tuscan, red grape varietal that derives its name from the Latin sanguis Jovis, “the blood of Jove”. Has aromas and flavors consistent to Sangiovese that are rich and fresh, reminiscent of raspberries and strawberries. Moderate tannins add fruitiness and the naturally high acidity provides complexity and length. Rapture can be enjoyed with any food, especially cheese, meats and pasta dishes. Amore: 80% Sangiovese, 20% Cabernet Sauvignon Blend: This soft yet assertive “Super Tuscan” blend, utilizing northern California fruit doles out black cherries, strawberries, dusty cocoa and aniseed. It is nicely balanced with bright acidity, polished tannins and vibrant flavors on the palate, leaving a delicious long lasting finish. Innocence: Lots of lovely intensity in this Rosé made from Riesling and Sangiovese varietals. This wine is bright and vibrant in color with delicate fruit aromas with floral hints, hauntingly dry, however with a kiss of sweetness and fruit flavors. This signature Rosé is our party, deck, beach and barbecue wine. It is just for fun and goes with anything and everything, so enjoy! Star Spangled: Star Spangled is a delightful prize boasting a fresh-crisp California style with distinctive hints of grapefruit and tropical tones. Star Spangled is comprised of 100% Sauvignon Blanc and will please the most discriminating wine lovers. It is un-oaked and finished in stainless casks. Cran Blanc: If you like Sauvignon Blanc, you will love Cran Blanc! It has the hint of the tart influence of our refreshing cranberry-raisin joined with the fruity-tropical tones of our Sauvignon Blanc. This unique to us blend is a delightful refreshing surprise. In a creative spirit, Cran Blanc can also be joined with champagne or Proseco to create a Mimosa-like experience. Three-Sip-Cran: We are pleased to offer this pleasurable elixir comprising Cape Cod dry-picked cranberries and a smaller percentage of California raisins. You can enjoy this wine chilled in a typical fashion, or in creative ways over ice with a squeeze of lime, with a spritzer or with fruit, like a Sangria. Three-Sip Cran will create an experience that will delight you with every sip! Click Here to view our recipe for our Cranberry Relish. The first questions we hear when people learn about Cape Cod’s new winery, … “Where are your vineyards, and where do you grow grapes?” There are many reasons why we do not grow our grapes on Cape Cod… land costs, an unpredictable climate, but primarily, Cape Cod is void of the mineral-rich volcanic soils needed to produce complex fine wines. So, if you were a winemaker, and had a mission to produce wines that would rival the best of the best, what would you do? As an example, a chef in a fine restaurant gathers ingredients for signature dishes from varied resources, far and wide. The paradigm of First Crush Winery is no different. It is structured around the procurement of high quality wine grapes, from one of the best wine growing regions in America. Subsequently, and only four days from harvest, winemaker Dr. Frank spends the next year nurturing the end result handcrafting them into award winning wines! First Crush Winery is fortunate to have a close relationship with a family of growers in northern California, located in the Suisun Valley AVA. They are not simply a special resource, they are our friends. Their vineyards border Napa Valley and benefit from a Mediterranean-like climate, fertile soils with volcanic minerals and significant marine air influences during the summer. Our growers, the four-generation Lanza family, maintain 250 acres of pristine vineyards within walking distance to Napa Valley on the southeast, closest to the Stagg’s Leap District. They can make available to us hillside and valley Cabernet Sauvignon, Merlot, Petite Syrah, Sangiovese, Malbec, Riesling, and Sauvignon Blanc. We have never entered of our wines into industry competition until recently. 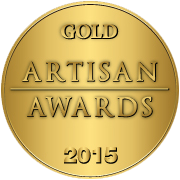 Last fall we submitted our two big reds in a noted San Francisco International competition, the Artisan Awards. We were thrilled that our Cab blend earned silver medal and our Zin blend earned gold. Not bad for an east coast winery going up against the best in the west! There are 30+ Massachusetts wineries represented in the Massachusetts Wine Association’s wine store in the new Boston Public Market located at Haymarket Square. We are pleased to report that First Crush wines are among the most popular wines sold in the store. Since their opening September 2015, they have sold over 250 cases of our fine wines at the market. Cabernet Sauvignon blend (Fusion) Rated 9.0, Sauvignon Blanc (Star Spangled) Rated 9.4, Reisling/Sangiovese Rosè (Innocence) Rating 8.8. 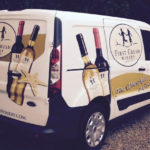 First Crush Winery is far from a typical winery since its winemaking COOP is the cornerstone of how the winery was formed, and remains the primary emphasis of our efforts. If you like our wines, joining the COOP makes perfect sense as long as you can visit us yearly to pick up your discounted reserved wines. COOP members save a minimum of $60.00 per reserved 12 bottle case of wine, optionally participate in winemaking and join us for frequent social events at the winery. Joining the COOP has no membership fee and it is not a wine club. It’s like purchasing wine futures at a meaningful discount. It is an opportunity for its members to enjoy our fine wines at a lower price and optionally participate in making the wine that will ultimately be their own. 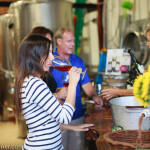 Members have the option to participate in key wine making events. Members receive ongoing email wine making progress notes and enology educational correspondence. Members participate in planned COOP social events and barrel tastings. Members can utilize the winery for private dinners and/or winemaker tours and tastings. Members benefit from camaraderie and friendships formed at winemaking and social events. Historically, couples will bring a bottle of wine and a small appetizer to share by all. Singles can mooch. Nothing formal planned this time except for me to provide a state of the winery talk for a few minutes and to give a live demo of our robot bottling machine. Be thinking of a fitting name for the bottle-filler thing-a-ma-gig. Primarily, our time will be occupied with mingling, socializing, sipping, smiling and tasting. It will be a nice pre-dinner beginning to a spring evening on Cape Cod. From Route 6, take exit 10 and proceed south on Route 124. In approximately 1.5miles you will come to a stop sign in Harwich Center. Make a right turn, proceed straight, west. This is the beginning of Great Western Road. After 1/2 mile, take the first primary right turn onto Main Street. Go past Station Avenue on the left, then go approximately 200 yards more and enter Olde Depot Industrial Park (527 Main Street) on the left. First Crush Winey resides in the three buildings on the right. Enter at #18. From the traffic light at the intersection of Route 134 and Upper County Road, proceed east onto Upper County and take an immediate left onto Great Western Road. Proceed approximately 2.5 miles, past Depot Street, past the bike-path crossing, and take the next left onto Lothrop. Go to the end of Lothrop and take a right onto Main Street. Proceed approximately 1/3 mile and the road will have two S-turns. Immediately after the S-turns, take a right into Olde Depot Industrial Park, 527 Main Street. First Crush Winery resides in the three buildings on the right. Enter at #18.